With the ability to record at 24-bit/192kHz, expect astounding audio clarity. With the ability to edit down to the sample level, expect absolute audio precision. 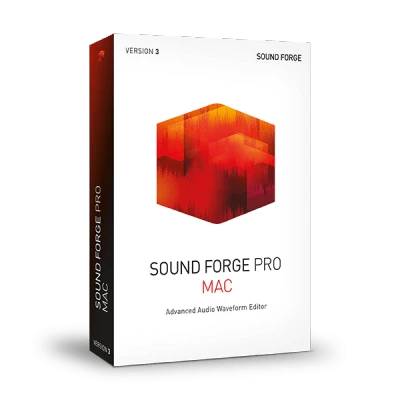 Audio mastering engineers around the world depend on the award-winning SOUND FORGE Pro Mac to generate flawless audio. The ability to edit at the sample level gives you precise control over the editing process. Configurable viewing panels enable you to toggle between multiple open files and configure open projects for easy access to the editing features you need. Easily switch between time-based or event-based editing modes. Precisely calibrated AES/EBU loudness meters help you make use of the entire dynamic range for broadcast audio while you ensure compliance with standards such as the CALM Act (Commercial Advertisement Loudness Mitigation Act). Flexible meter positioning puts you in control of the location and orientation of the meters. SOUND FORGE Pro Mac 3 offers a complete round-trip workflow with SpectraLayers Pro 4. Experience the best of both waveform editing and spectral editing. Menu commands enable you to easily move files between the two applications to utilize the unique strengths of these powerful audio tools. The standalone batch processing application included with SOUND FORGE Pro Mac automates multiple file processing in a single operation. Convert to a new file format, add processing and effects, add metadata including art work, to multiple files in a single batch process. Use the normalize feature to accomplish standard peak level normalization, or modify an audio file's dynamics directly using average RMS level normalization—great for matching the apparent loudness of different recordings. Improve the quality of your audio or create unique sounds using the included processes and effects. To add more sound-shaping possibilities, SOUND FORGE Pro also supports 64-bit Audio Units (AU) and 64-bit VST 2.x plug-ins. Apply effects individually or use a plug-in chain to add multiple plug-ins to process your audio. Adjust parameters and preview the results in real-time prior to rendering. SOUND FORGE is the application of choice for audio editors. 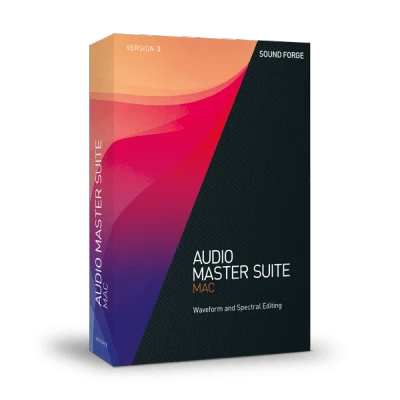 Precise recording, intuitive workflows, professional signal processing and a variety of effects make SOUND FORGE one of the most exceptional audio editors on the market. SpectraLayers™ Pro 4 sets new standards in spectral audio editing. Color-coded layers, precise selection tools, and an easy copy and paste editing workflow are all supported under the hood by impressive performance enhancements. Immerse yourself in SpectraLayers Pro for an audio restoration and sound design experience that will open new horizons on every launch. High speed mastering: Mix using Ozone 8 Elements by iZotope for high quality results that are ready for broadcasting or streaming platforms. Based on unique Ozone 8 technology, Ozone Elements combine custom selected professional presets with simple macro controls for working on sound. Give a final master a fuller, more powerful sound. Audio restoration in exceptional quality. Award-winning tools for audio restoration enable you to work with total precision. RX Elements offers comprehensive editing options, spectral editing and also contains four essential plug-ins for real time audio editing. Locate and edit issues in your audio material on a visual level.